"Well known to engraving enthusiasts for his 1980 book American Engravers, author C. Roger Bleile has followed this landmark work with a monumental publication entitled American Engravers - The 21st Century. This deluxe hardcover 9x12 inch landscape format book features the best works and individual engraver biographical sketches of America’s finest contemporary engravers. Since the mid-18th century, Americans have always had a love affair with hand wrought decoration of guns, knives, swords, and weapons of all sorts. 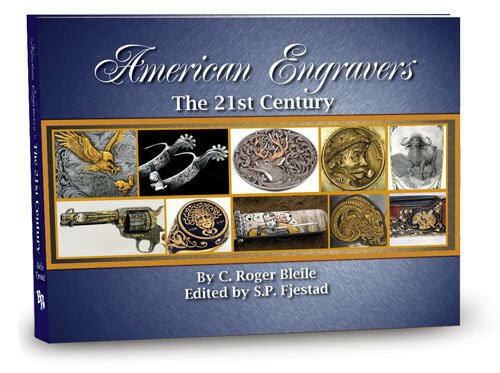 A great addition to any collector’s or engraver's library, American Engravers – The 21st Century features over 360 pages showcasing the talent and artistic abilities of 44 of America’s best living engravers. " "The new book American Engravers - The 21st Century will be 360 pages (twice the size of the original American Engravers), full color, and containing a CD-ROM bound into the back of the book. The CD will feature a directory of engraving schools and private instructors, a directory of manufacturers and vendors, an engraving glossary with over 400 illustrations, and a special section called Tools and Techniques of the Hand Engravers. That section will familiarize the readers with all of the tools we use (both manual and powered) as well as step by step illustrated explanations of scroll engraving, relief engraving, and gold inlay. Along with the pictorial sections where the individual engravers are featured with hundreds of images of guns, knives, jewelry, and western gear, I have written a chapter on the state of our art in the 21st century. In addition, R. L. Wilson has written a 20 page illustrated chapter on the history of American engraving, and publisher S.P.Fjestad has added a chapter on how to determine the values for engraved firearms in today's marketplace." The publishing company is sold out, however the author, Roger Bleile has the last of the copies for sale. They are $100 for an autographed copy plus $5.00 postage. If you are are not in USA shipping will be more. Contact Roger Bleile directly at his Email to purchase.